In the third process of Time Management which is Sequence Activities process, the major output is the Network Diagram. During Sequence Activities process, the activities defined in define activities process are sequenced. Because some activities will depend on another. The Network diagram illustrates the project activities with boxes and displays the interrelationship of activities. Precedence Diagramming Method (PDM) is the most common method to draw network diagrams. So naturally, there will be some relationships and dependencies between the activities in Precedence Diagramming Method. If you enroll in a project management certification course you will have a detailed training about these relationships in Precedence Diagramming Method. 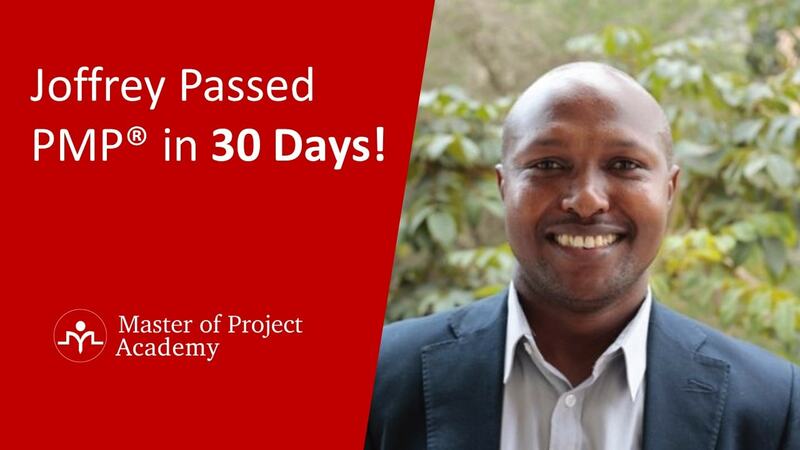 Because there are many questions about Time Management knowledge area in PMP exam questions. 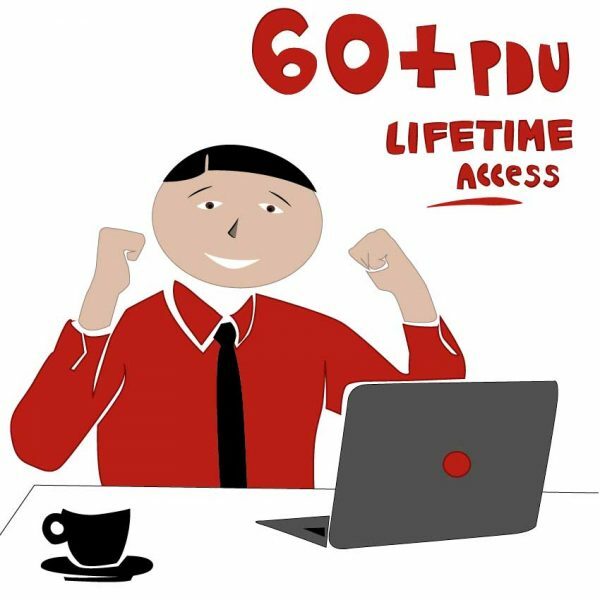 So it’ll be wise to include this knowledge area and its processes in your PMP study plan. Also, in this article, we are going to explore the types of relationships and dependencies in Precedence Diagramming Method while giving real-life examples. Let’s go over each type of dependency in Precedence Diagramming Method one by one. The 1st type of dependency in Precedence Diagramming Method is Finish-to-Start dependency and abbreviated as FS. This is the most common dependency type used between activities. If an activity cannot start before a predecessor activity finishes, then a finish-to-start dependency must be between these activities. For instance, in a construction project, you cannot paint the building before you complete the construction. In a software project, you cannot start testing of a screen before it is developed. These are examples of finish-to-start dependencies of the activities in Precedence Diagramming Method. The 2nd type of dependency in Precedence Diagramming Method is Start-to-Start dependency and abbreviated as SS. This type of dependency shows that two activities will start together. 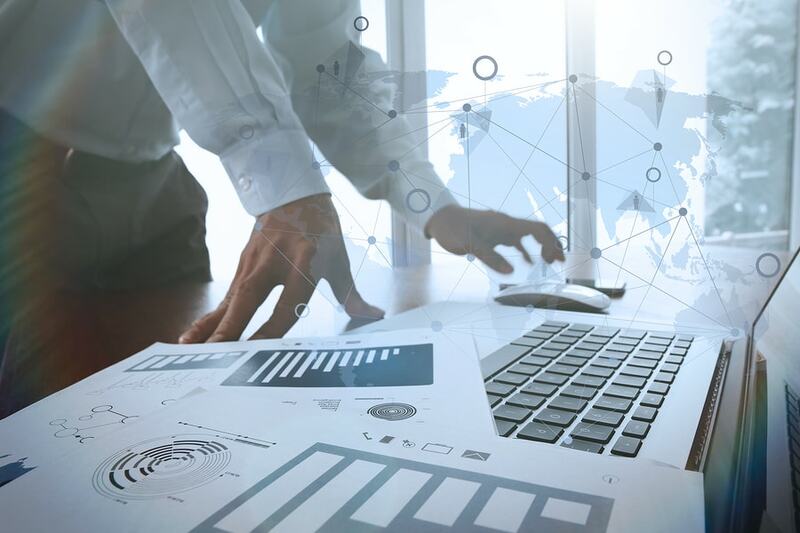 For instance, in a construction project, building the mainframe of the construction will start with the procurement of materials. 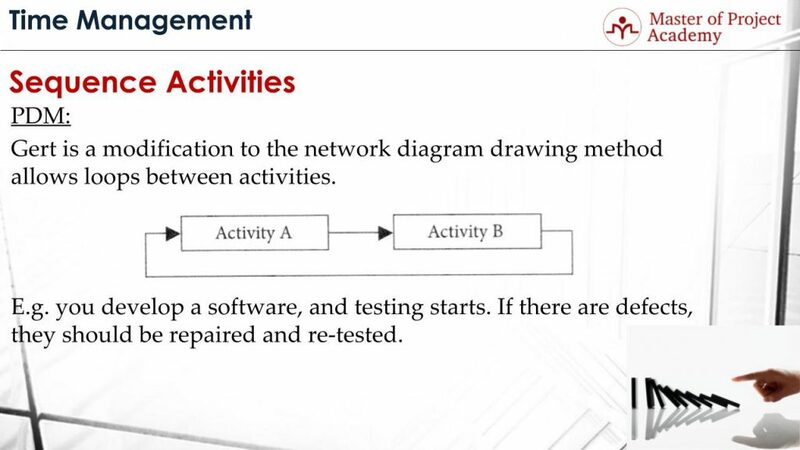 In this case, these activities will be shown as start-to-start dependent in the network diagram. The 3rd type of dependency in Precedence Diagramming Method is Finish-to-Finish dependency and abbreviated as FF. This type of dependency shows that two activities in a project will finish together. For instance, in a software project, during tests, bugs will be found regarding the developed software. And these bugs will be fixed by the software developers. But after that, the testing team must re-check whether the bug is really fixed. Therefore, testing and bug fix activities are an example for finish-to-finish type of dependency in Precedence Diagramming Method. The 4th type of dependency in Precedence Diagramming Method is Start-to-finish dependency and abbreviated as SF. Start-to-finish dependency is a very rare type of dependency in projects. In this type of dependency, Activity B can finish only after Activity A starts. 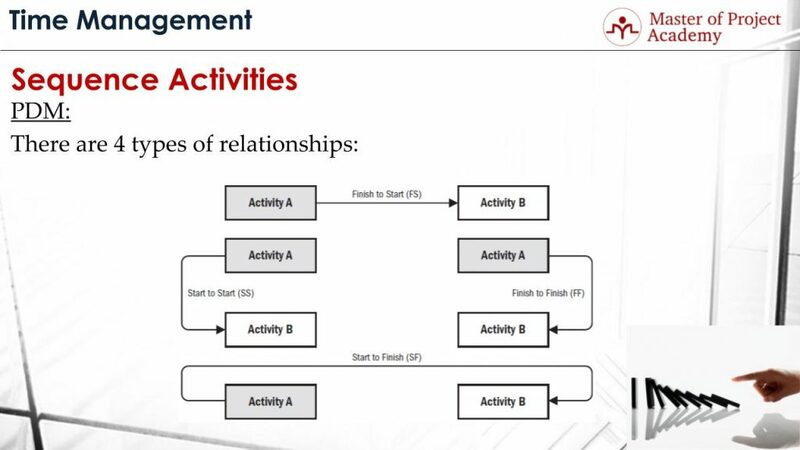 These types of relationships can be used in just-in-time supply chain materials for example. Let’s assume that you are working in a car manufacturing company and in your assembly line, you are using an electrical component for the cars which is provided by a supplier. And let’s say, there are 100 components in your warehouse. But, you have a threshold that if this number of components falls below 20, a new order should be placed to the supplier of the electronic component. In this case, there is a Start-to-finish dependency between the remaining number of electronic components in the warehouse and placing a new order. It is better to describe GERT here. GERT is a modification to the network diagram drawing method allows loops between activities. this figure shows an example for the GERT. Activity B has a finish-to-start dependency to the Activity A. Activity B can start only after Activity A is finished. However, after Activity B is completed, activity A is re-initiated. We can give the software development and testing as an example for this scenario. 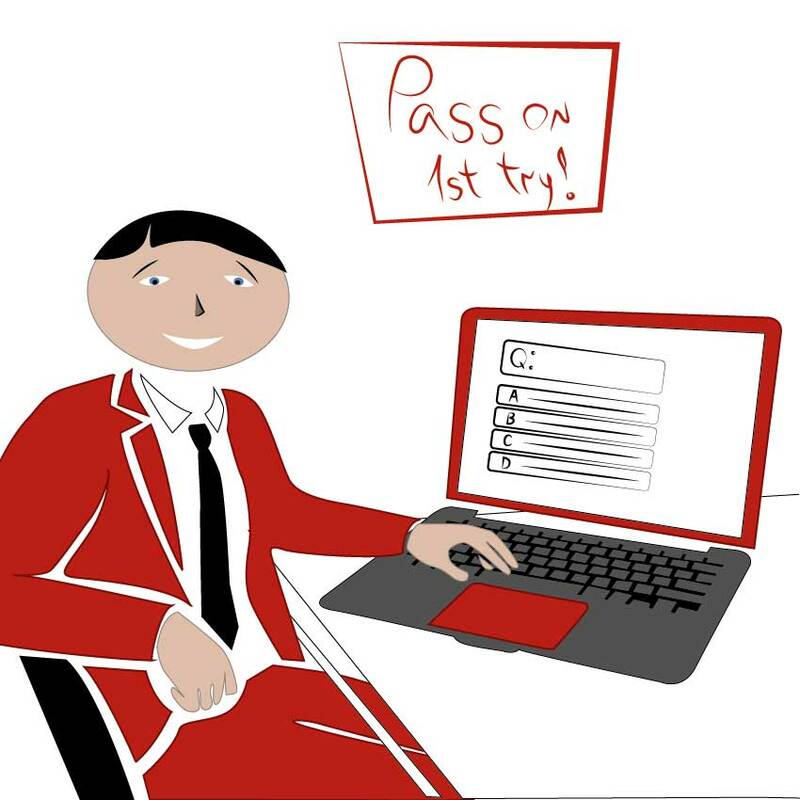 After software development finishes in a project, testing must start. And during tests, bugs will be found. And these bugs must be fixed by the software developers. Bug fixing and re-testing will continue until all bugs of the software will be finished. This is an example for GERT. We have seen the type of relationships in Precedence Diagramming Method. Now let’s see the dependencies in Precedence Diagramming Method. What are the 4 types of dependencies between project activities? Let’s go over each of dependencies in Precedence Diagramming Method, one-by-one. The first type of dependency in Precedence Diagramming Method is Mandatory Dependency which is known as hard logic as well. Mandatory dependency is inherent in the nature of the work. 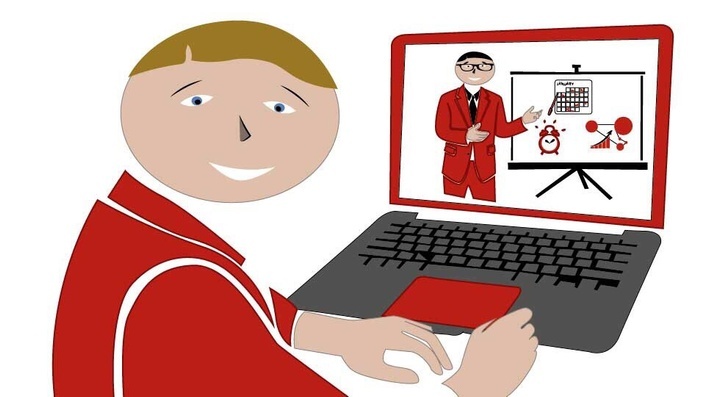 Let’s consider a software project, and there is a screen that will be developed in the scope of the project. Can you test it before the development finishes? Of course not! Therefore, there is a mandatory dependency between the development of the screen and testing of the screen in this case. 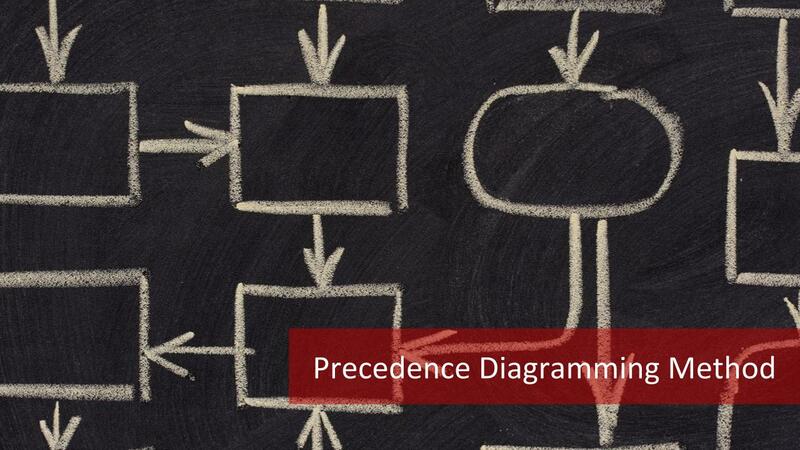 The second type of dependency in Precedence Diagramming Method is Discretionary Dependency which is known as preferred, preferential or soft logic as well. Discretionary dependency is determined by the project team and can be changed in order to shorten the project. Let’s consider that John is a team member in the project and he has several activities. 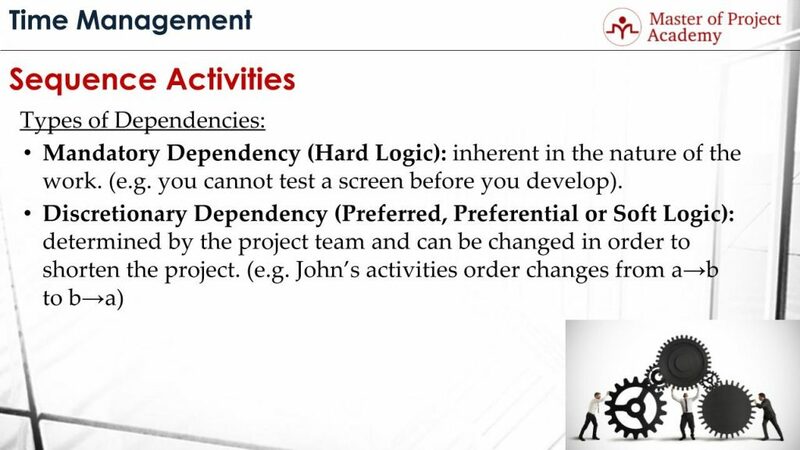 In order to complete the project earlier, you might change the order of John’s activities. Activities remain same but the order changes. This is an example of the discretionary dependency in Precedence Diagramming Method. The third type of dependency in Precedence Diagramming Method is External dependency. External dependencies come from outside of the project. For instance, in order to start your project, there is another project that must be completed first, this is an example of external dependency. Or, if there is a government regulation that must be completed to continue the rest of the project activities, this is an example of external dependency in Precedence Diagramming Method as well. The fourth type of dependency in Precedence Diagramming Method is Internal dependency. 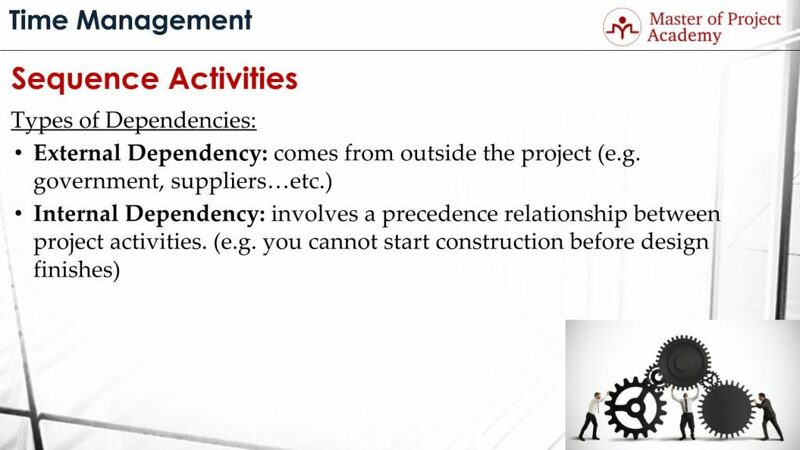 Internal dependency in Precedence Diagramming Method involves a precedence relationship between project activities. 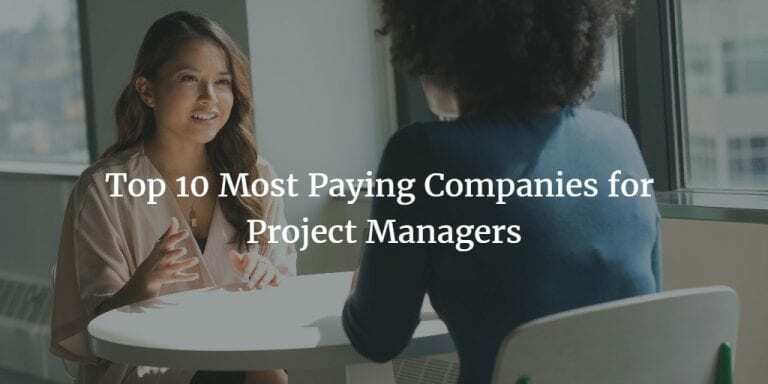 Let’s consider that you are working on a construction project. Activities must be performed in order to complete the project. For instance, before the architecture team finishes the design of the building, construction work cannot start. This is an example of internal dependency. 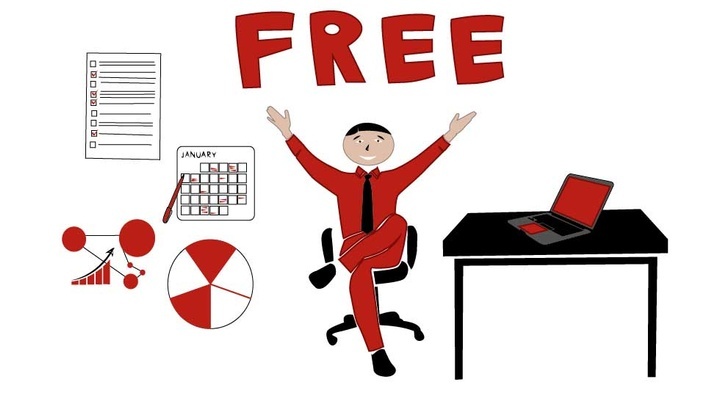 Or, if there are several activities assigned on a project team member, he cannot start a new one before completing the previous one although there is not a mandatory dependency.